Steven D. Levitt and Stephen J. Dubner's excellent and bestselling book Freakonomics (1) has been considered a witty and simple way to vulgarize economic theory, by translating into prose Levitt's formal work on crime, drug dealing, politics and others. Levitt, who in 2003 won the John Bates Clark Medal given by the American Economic Association to the best American economist under forty, defines himself as a "rogue economist exploring the hidden side of everything". The principle of Freakonomics consists in simply applying the rational utility-maximization paradigm of microeconomics to unconventional subjects, usually not considered by "traditional" economists. Using the powerful tools that economics provide, Levitt tries (quite successfully) to find the rational explanation for observed and unexplained phenomena, usually assumed as "irrational", "coincidences" or simply "unexplainable". Explanations often lie behind one of the basic definitions of economics: it's the analysis of what motivates people and which means they use to get what they want. Why is this interesting for the case of Bolivia? Several times we've heard and even said ourselves that a good share of the Bolivian population acts irrationally, that "logic does not operate higher than 2500 meters over the sea level", that cultural differences make Andean mentalities incompatible with the concepts of the marginalistic revolution or more romantically, that Latin-American Magic Realism dictates the way things work in this continent. This is all wrong for so many reasons. First of all, what seems to be irrational behaviour happens all around the planet, it does not discriminate like the FIFA does. Secondly, he who says that Andean mentalities and marginalistic maximization are incompatible has never been to Mercado Rodriguez nor to a microeconomics lecture. Finally, Magic Realism was invented by German painters, which is not only an oxymoron, but proves that rationality does operate in magical contexts. Indeed, removing the rationality hypothesis is simply removing any justification for economic analysis, because this assumption is the corner stone for all economic reasoning. If indeed Bolivians were irrational, we should lay-off right now all those expensive economists and hire an army of sociologists of cultural determinism. So what does motivate Bolivians? Let's look closer to a very precise example of everyday life in Bolivia. The "Entrada del Gran Poder" is a patronal mixed catholic-folkloric parade, where devotees express their faith by dancing and drinking during several hours wearing sumptuous and expensive costumes. Sadly the lack of empirical data or time to gather it makes of the following example pure speculation, but it might be interesting to push the exam further. 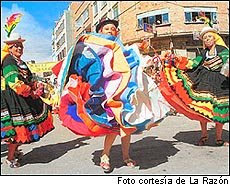 What would explain the fact that incredibly large sums of hardly-won money, not only by Bolivian but by any standard, could be spent in 12 to 48 hours in costumes, dancing and drinking? Up to 1000 USD could be spent on a "moreno" costume, which is similar to any very bourgeois European expenditure level per hour celebrated, without counting the drinks. And obviously, by Bolivian standards it's a hell of a lot of money. Skeptics would consider this expenditure as an unforgivable waste in such a poor country, an offence to morale and good manners while wasting the whole year's family effort on one massive spree. The more naive would consider it as a proof of devotion to the Señor del Gran Poder: this is obviously false when we compare the miserable amount of charity given to the Church of El Gran Poder to the impressive level of selfish expenditures on bright costumes and boxes of beer. So what would justify such an important investment both in money, effort and time? In reality it's all about signaling, like economists would say, about revealing types in contexts of moral hazard and adverse selection (2). Indeed, no matter what moralists would say, someone who dances 12 hours straight with a 40 kg costume on his shoulders while drinking under La Paz hot winter sun is signaling anything but laziness. This reveals the level of effort that a person can provide, solving issues of moral hazard. The system quickly discriminates the "bad" types from the "good" types, which is an important signaling in the labor market, in the marriage market and in the prestige market. But the most important signaling comes from the money invested on costumes and beer. It quickly reveals if the agent is or not stingy, dependable, has good relationships with other trustful agents (moral hazard) and above all if he is solvent (adverse selection). Most dancing groups (comparsas) are organized around one corporation, or association of people working in the same commercial sector: the Comparsas work more as Unions than groups of devotees to the Señor del Gran Poder. So, the revelation of types in each comparsa is indeed an investment because it allows signaling to potential commercial partners, credit lenders, investors and others, who's worth dealing with and who's not. Contrary to Akerlof's market for lemons (3), here good types drive bad types out of the market, because information flows from everywhere: the system creates a transparent market. This degree of transparency would be hardly reachable in a non-Gran Poder context or other kind of folkloric manifestation, because there is not like in Occident an everyday signaling system by dress codes, arranged houses or other ostentatious goods. This implies that the studied market needs some updates, which explains the frequency of folkloric parades, requires innovation on costumes, music and dance-steps: this confers the folkloric prestige market a dynamic feature. In every manifestation, but mostly at the Gran Poder parade, signals of who has prospered, who has become more reliable and who has lost prestige are given. But, like in any informational market, some agents might have incentives to "cheat", by signaling a "high type" investing more than what they have the possibility to (by borrowing for the costume). This is not necessarily cheating, because most investments are financed by credits, so investing on prestige for a not-necessarily solvent agent can make him an interesting commercial partner in spite of everything. But the system is merciless, because it's dynamic. Every year agents have to renew investments, update the level of prestige capital, and signal innovation, modernity and adaptation. The cheating type could hardly afford to renew loss making investments every year, thus in time the bad types would be driven out of the market. However, what is interesting is that types can change from year to year (because it is a mix between moral hazard and adverse selection): in one year they can change their level of effort and can become more or less prosperous. The system is highly incentive compatible, because by inciting higher levels of effort, it grants important rewards in prestige levels. As I said before, this theory is purely speculative and lack any empirical support. But this phenomenon moves several hundreds of thousands of dollars every year, provides qualified and creative jobs for artisans and is an important cultural event. So it's worth analysing if in fact the Gran Poder is more beneficial than costly for society, following the argument that it brings transparency to the popular commercial zones in La Paz. To measure this could prove to be a hard task: we could try to estimate if the rate of transactions and new contracts increase in the weeks following the parade, but this effect could be countered by the fact that households endure important expenditures before and during the parade, limiting their commercial potentialities in the short run. Nevertheless, the point I want to make is that probably there is something else behind all these expenditures, than just folklore. Like Levitt, the new generation of economist will probably have to analyse more unconventional subjects to have a better understanding of the world that surrounds them. By leaving prejudice aside, we might discover that people is more logical and rational than expected. (*) Visiting Student/Researcher at the Institute for Advanced Development Studies, La Paz, Bolivia. The author happily receives comments at the following e-mail: jsmoralesb@gmail.com. - Institute for Advanced Development Studies 2007. Feel free to circulate in its original form. Past issues can be found at www.inesad.edu.bo/mmblog.htm . The opinions expressed in this newsletters are those of the author and do not necessarily coincide with those of the Institute.